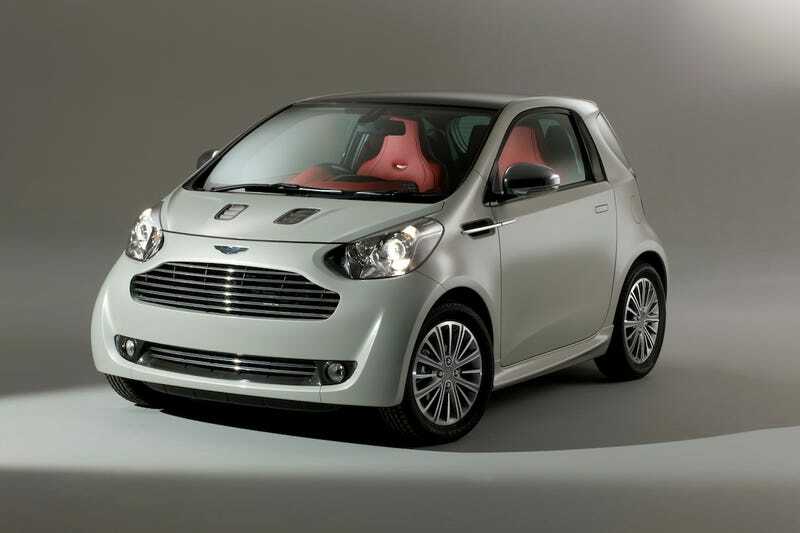 In June, Aston Martin released a photo of its Cygnet concept, a Toyota IQ-based city car with a Vantage grin. Today Aston's dropped images of a seemingly production-ready Cygnet with an expected $32,000 price tag. Aston hopes to bring the Cygnet to production some time in 2010, with the aim of as many as 2,000 cars a year. If you're wondering the same thing we are, "Why, god, why?" consider this: If Aston sells a couple thousand Cygnets, each emitting under 120g/km of CO2, that's a hell of a reduction in its fleet emissions. But the looks are...umm...well...as these first official images show, the Cygnet is still closely based on the Toyota iQ city car, retaining the same basic body shape and even the same front lights. The front has been given a heavy Aston-style rework, however, complete with trademark grille and even miniature bonnet vents. In the rear, the iQ light cluster has been tweaked to give the Cygnet the familiar horseshoe shape, albeit set in the opposite direction to the normal Aston design language. Aston hasn't yet officially committed to building the Cygnet, but says "work on the concept is ongoing and will continue into 2010 when it is hoped that it will become a production reality initially available to Aston Martin customers in the UK and Europe." Should that happen, expect a production version of the Cygnet to cost around $32,000 — making it the most expensive city car we've ever seen. Inside, the Cygnet retains the basic cabin architecture of its Toyota cousin, albeit cabin treatments extensively — and expensively — retrimmed. Ooh, and look, it even has an iPhone docking station, just like all the cool city kids have. Overall — if you're being kind — you could say that the Cygnet looks like an pre-adolescent Aston. If you're being cruel, you'd say it looks like the result of a horrible genetic experiment. However, we'll leave the choicest words up to you.